It’s onto Week 6 of the fantasy football season, and there is plenty to unpack in the ever-changing backfield landscape. Jay Ajayi’s season (and likely his Eagles career) is over, but not until after he first played through a broken back and then a torn ACL. Elsewhere, Matt Breida is looking at a multi-week absence with a mid-ankle sprain, while Saquon Barkley and Kerryon Johnson gave fantasy owners injury scares but are reportedly fine and dandy. The Lions have a bye this week along with the Saints. Below, we’ll dive into five running backs who are trending up and five who are trending down. Before we dig into Week 6, let’s take a quick look at how things played out for the running backs we broke down last week. Notes: Whereas Michel delivered the goods, fellow rookie Chubb remained stowed away in mothballs after his breakout Week 4. It won’t be the last time I am duped by Cleveland’s coaching staff. … Gore averaged 5.3 yards on his 12 carries, but with no passing game involvement, he is still best viewed a touchdown-or-bust flex as cautioned last week. … With Marlon Mack slated to return, now would be a good time to float some trade offers for Hines, who is the RB13 in PPR formats on the season. More on that situation below. … To the enjoyment of no one, Williams played 33 snaps to Ty Montgomery’s 29 and Aaron Jones’ 22. I’d love to promise Jones’ fantasy owners that the universe will eventually straighten itself out, but we’ve been down this road before with Mike McCarthy. Just because it’s obvious doesn’t make it wrong. And, well, Crowell was parked on benches in more than 60% of ESPN leagues last week when he broke the Jets’ single-game rushing record. In gashing Denver for 219 yards and a score on only 15 attempts, Crowell’s average of 14.6 YPC is unmatched by any player in NFL history with that many carries in a game. While suddenly the RB8 on the season in standard leagues, keep in mind that teammate Bilal Powell had a team- and season-high 20 carries this past week. Also, Crowell sat out Wednesday’s practice with an ankle injury. No word yet on the severity of that, so his participation at Thursday’s practice should be monitored. One week after he was mentioned in this space as trending down, Morris was this week’s top add given Matt Breida’s ankle injury that is expected to keep him out multiple weeks. What’s particularly appealing is that Morris racked up 21 touches despite playing only 44% of the snaps. Granted, Morris offers next to nothing as a receiver, but he is tied for second in the league with six carries inside the 5 (he’s scored on only one of those six). His ceiling is limited in the 49ers’ short-staffed offense, but with more volume on the way, Morris is a pretty safe flex option for as long as Breida remains shelved. 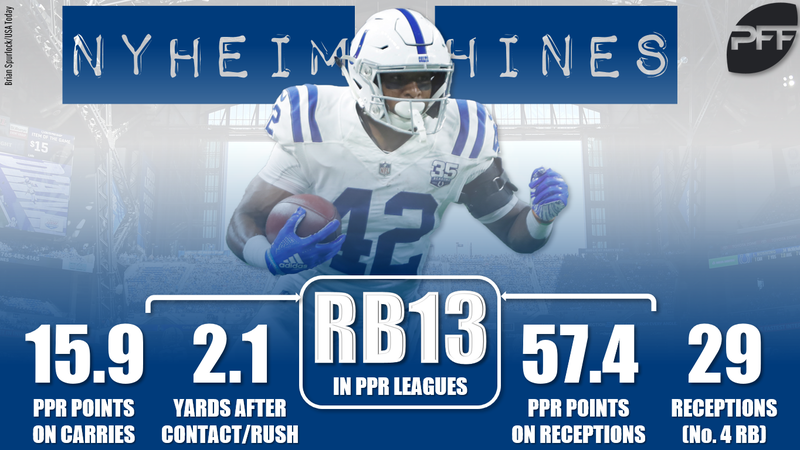 After five games, Nyheim Hines is the RB13 in PPR. His receiving skill set is a big part of that, as Hines’ 29 targets are the fourth-most by a running back this season to go with his eighth-best pass-blocking grade (82.7). For those reasons, Hines will continue to be a key part of the Colts’ weekly game plan. However, Hines is also graded 36th out of 58 in rushing (63.1) for an offense that has the most lopsided pass-run balance in the league. Coach Frank Reich acknowledged this week that he needs to mix in the run game more. Enter Mack, who earned our No. 16 rushing grade as a rookie last season (72.8) and was 14th in elusive rating. With Indy’s O-line also starting to take shape, Mack was a full practice participant on Thursday. He’s been out of sight, out of mind, but there’s likely no one else on your waiver wire (25% owned) with Mack’s RB2 potential moving forward. One of this week’s biggest waiver wire conundrums was between Smallwood and Corey Clement. With apologies to those who emptied out their FAAB piggy banks on one of the Eagles’ RBs this week, you should know that even Jay Ajayi had not topped 15 carries in any of his last 12 games. With that said, barring a trade, Clement is in line to be the 1A to Smallwood’s 1B. When Ajayi missed Week 3, Clement out-snapped Smallwood, 45-29, and held a 19-13 edge in touches. Both backs also caught three passes in that game and had a carry inside the 10, with Smallwood scoring on his short-yardage opportunity. Either back could certainly get the hot hand and sniff RB2 territory in a given week, but say it with me now: there will not be a featured back in Philly. Over his last two games, Davis has averaged 5.1 yards on 33 carries and scored three TDs, ranking eighth in PPR scoring in that span. Against the Rams this past week, Davis played 10 fewer snaps than Chris Carson and was out-touched 20-14. What’s more, of Davis’ 12 carries, three came inside the 10. Point being, even if he is playing second fiddle to Carson, Davis still can still be an upside flex. And let’s face it, Carson’s NFL resume consists of seven games, and it’s not like Pete Carroll ever sets anything in stone. Even after returning from a three-game absence last week, Freeman’s stock might be at an all-time low. When both he and Tevin Coleman have been active so far this season, Freeman played only one more snap than Coleman in Week 5, and only three more snaps in the season opener. Last year, the split was closer to 60/40 in favor of Freeman. We’re five games into 2018, and Falcons’ running backs (including Ito Smith) have zero rushing touchdowns on six combined carries inside the five. On top of that, Freeman’s Week 6 status is now in doubt with a new injury that caused him to miss Wednesday’s practice. I know, it’s a curious name to see on the “trending down” section considering Conner is coming off the week’s top RB fantasy performance. However, we all knew there would be an expiration date, and that date is fast approaching. For those who’ve held onto Conner this long, your best bet at this point may be to stay put and see if the Steelers end up dealing Le’Veon Bell prior to the NFL trade deadline at the end of this month. Float some trade offers, of course. Sample trades readers mentioned in this week’s live chat ranged from Phillip Lindsay to Jarvis Landry. If Ben Roethlisberger has any say, Conner will still be a part of the Steelers’ weekly game plan when Bell is on board. Of course, historical usage suggests otherwise, and Mike Tomlin has given absolutely no evidence he will go to a committee. According to coach Bill O’Brien, D’Onta Foreman is on track to return next week when he is eligible to come off the PUP list. Of course, Achilles injuries are a tricky thing, so Foreman will likely be brought along slowly. Then again, the Texans could use a spark for their ground game, and Foreman did turn 10 carries into 65 yards and two scores in his last game action. Prior to Miller sitting out Week 5, he and Alfred Blue essentially split the workload in Week 4. Blue logged 13 carries to Miller’s 14 and was out-snapped by only a 46-40 margin. However, Blue has also averaged only 2.3 yards on 33 carries over the past two games. Of course, Miller has done little with his opportunities, failing to crack 100 yards in any game since last season despite averaging 15 carries in that 20-game sample. His average of 0.25 fantasy points per opportunity ranks outside the top 60, right alongside the likes of Derrick Henry, Jordan Wilkins, Duke Johnson, and Jamaal Williams. Yuck. This should be an obvious one considering Bernard sat out Week 5 with an MCL injury and is doubtful for this week. Still, he remains owned in 64% of ESPN leagues, and I’m not sure why. Joe Mixon touched the ball 25 times in his return, and he’s had 22 or more touches in all three games. That doesn’t leave many scraps for Bernard, who totaled 12 touches over the first two games when he and Mixon were both active. Bernard need not be rostered outside of super deep leagues. If last week is any indication – and granted, it usually isn’t with Pete Carroll – the Seahawks have settled on a two-back rotation. Unfortunately for Penny, the team’s first-round pick is not one of those backs as he did not get a single snap against the Rams. This happened one week after Penny turned nine carries into 49 yards, and two weeks removed from a game in which he got 10 carries while a healthy Chris Carson watched from the bench for the entire second half. He remains a worthy stash based purely on draft capital, but by no means is he a must hold.